Conventional wisdom says that Arizona is a red state that does not elect Democrats. Results from past elections indicate that Senator John McCain is unbeatable in this state where he has never lost an election, always winning by 20% more than his opponent. Common sense says that nobody with ambition would sacrifice their career to run against this titan of the Senate. And yet, Representative Ann Kirkpatrick (AZ-01) is putting her political career on the line in an attempt to win what is shaping up to be the dark horse election of the year. Although some may see it as a commendable but quixotic quest to win as a Democrat in Arizona, others say that there is an incoming storm that may sweep her into office. Ann Kirkpatrick is a top tier candidate for this race. She is a moderate Democrat that won reelection in a Republican district during the 2014 Republican wave, she has successfully secured federal money for building projects for her booming state, and she currently sits on the House Committee on Veteran’s Affairs. All of these things play well in a red state like Arizona. Representing a district in Arizona that is geographically larger than Pennsylvania, Kirkpatrick has had to forge relationships with people across the state. From rural towns to the urban area of Flagstaff, Kirkpatrick’s experience with such a variety of communities has prepared well her for a statewide run. Notably, Kirkpatrick has maintained a warm relationship with the American Indians of her district. The Navajo Nation and Apache Reservation lie within her district, making it the most heavily American Indian district in the country. Although statewide they make up only 4.6% of the population, having a small but significant base of support should serve her well in the election. However strong of a candidate she is, Kirkpatrick stills faces the fact that Arizona is typically a red state and has only voted for a Democrat for president (Bill Clinton, 1996) once since 1948. Yet a combination of demographic shifts within the state and the current political headwinds have colored Arizona purple, at least for this election. Nationwide, Latinos have been voting for Democrats with increasing frequency. Republican opposition to issues important to Latinos such as universal healthcare, education reform, and immigration reform have made Latinos a more Democratic constituency. Additionally, Latinos are growing faster demographically than any other group or ethnicity. Arizona is feeling this effect more prominently than other states. Making up over 30% of the state’s population, Latinos could potentially hold more political power in Arizona than almost anywhere else. However, the state’s Latinos typically vote at rates much lower than the general population at only 17% of the state’s voters. It should not be a surprise to hear that during this election Latinos are projected to turn out in higher levels, thanks to their fervent resentment of Donald Trump’s controversial comments. The projected surge in Latino voting could couple with the general ‘blue-ing’ of the increasingly urban population of cities like Phoenix to give candidates like Kirkpatrick the boost she needs to win in November. The problem for past challengers to John McCain is that despite the gradual changes in demographics, he has managed to stay strong in the state. His reputation as a moderate and his appeal to Latino voters have kept him strong in Arizona. However, both of those traditional strengths are eroding during this election cycle. When John McCain ran for president in 2008, he ran as the “maverick.” He ran as the person willing to compromise and make deals in Congress so that he could accomplish important tasks. His record of bipartisanship supported his claim. In Arizona, this has made him attractive enough to moderate and liberal voters that he has traditionally won in landslides. This election cycle is different. His meek response to Trump’s assertions that he, McCain, is not a true war hero, and then his later support of Trump for president has lost McCain bipartisan credibility among many. Additionally, his controversial comments on how Obama is responsible for terrorist attacks such as the Orlando shooting while the nation was in mourning have not won him many fans. Although John McCain’s support for immigration reform has given him a good relationship with the state’s Latinos, that too has changed. The Latino electorate is younger than in past elections. They are less likely to remember McCain as the man who co-sponsored multiple immigration reform bills than the older generations of Latinos who supported McCain in the past. 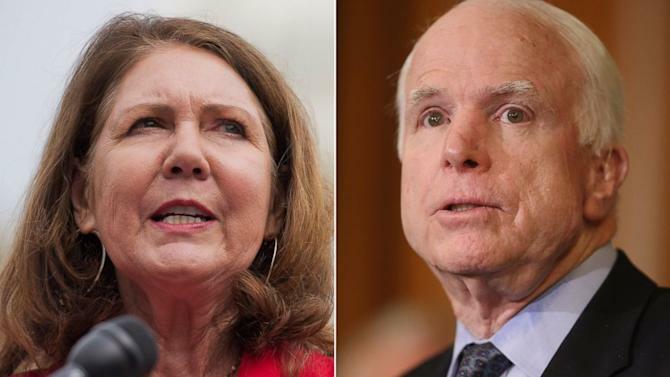 When Ann Kirkpatrick first announced her bid for the US Senate, many felt that she was a qualified candidate, but that Arizona was too red of a state and McCain too strong of an incumbent for her to win. In the time since, she has shown us that due to her own strength as a candidate, the ‘purpling’ of Arizona, and the weaknesses of John McCain, her race is winnable. Many still consider Kirkpatrick’s bid for office a longshot and that it would take a wave election to see her win. They are not wrong. Her limited statewide recognition, McCain’s strengths as an incumbent, and Arizona’s Republican tendencies are still formidable obstacles to overcome. But Democrats need to invest in races such as Kirkpatrick’s. If Hillary wins Arizona, it could be seen purely as a reaction to Trump. A Kirkpatrick victory would open the door to making Arizona more competitive in the future. When the Senate map looks unfavorable to Democrats as it is and with Republicans dominating local politics nationwide, Democrats need to start turning more states blue. They cannot simply wait for the predicted long-term demographic changes to favor them. They need to be aggressive, they need to have clear vision, and they need to support candidates in non-traditional Democratic states. In 2016, that means fighting their hearts out to see good candidates like Kirkpatrick win.